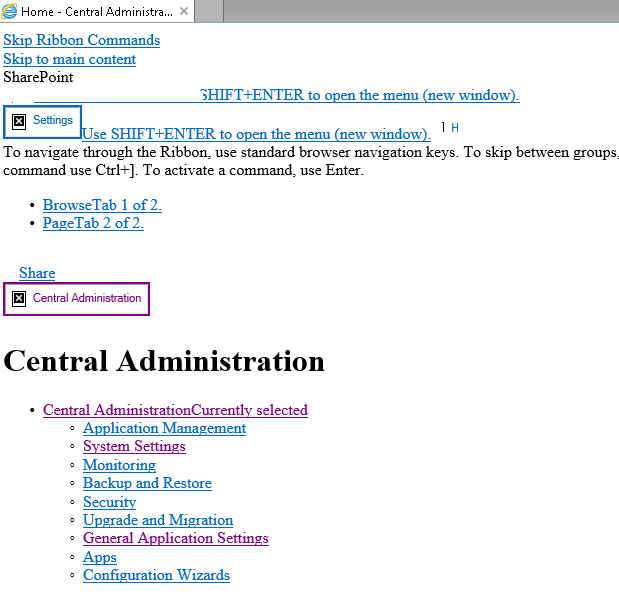 I have deployed the Sharepoint 2013 site in the App server(Windows 2012). We have seperate DB server. My site was working fine. Until I ran the vbs script given by Security team, inorder to harden the IIS. I checked in the IIS, the sites are just running fine. I tried the urls (_layouts/15/settings.aspx), Nope..
Any one faced similar problem. Can help to resolve this issue ? WOW, thats alot of lazy changes to IIS. Stuff that i wouldnt recommend.... if you need to do it than do one thing at a time or atleast test it on a test server first! i understand you might have 100's of web apps and app pools but doing multiple changes for all webapps is crazy --- unless well tested on just one webapp to start with!! the part that i could see that would return a 404 that i spotted within the code was changes to host header for each site! what are the host settings in iis for each site? what can you see? do you have a host headed, whats the port? ip address? first get central admin so go view that first! i think the port is standard throughout as 42820 type is http ip should be blank (when edit item its all unassigned ips) no host no binding info! once done click ok, now back at the site settings on iis, select basic settings below bindings. click test settings. if the path is visable and available and the account used for app pool account for central admin than you should get two ticks, if not you need to fix those issues! repeat process for all other sites! if you look in iis manager under the site handler mappings you would see asp/aspx but under mime types you would find nothing. Not the answer you're looking for? Browse other questions tagged sharepoint-foundation sharepoint-server iis or ask your own question.